This is the latest jewellery trend thats a big hit in the US. Create your own personalised memory locket and fill it with charms and trinkets that tell your own story. 1. 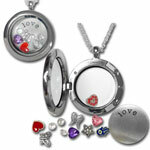 Select your Locket from our various styles. These open and close with a magnetic fastening. 2. Add an affirmation Plate (optional). 3. Choose your favourite motion charms from our range. These will move, sparkle and float around your locket.